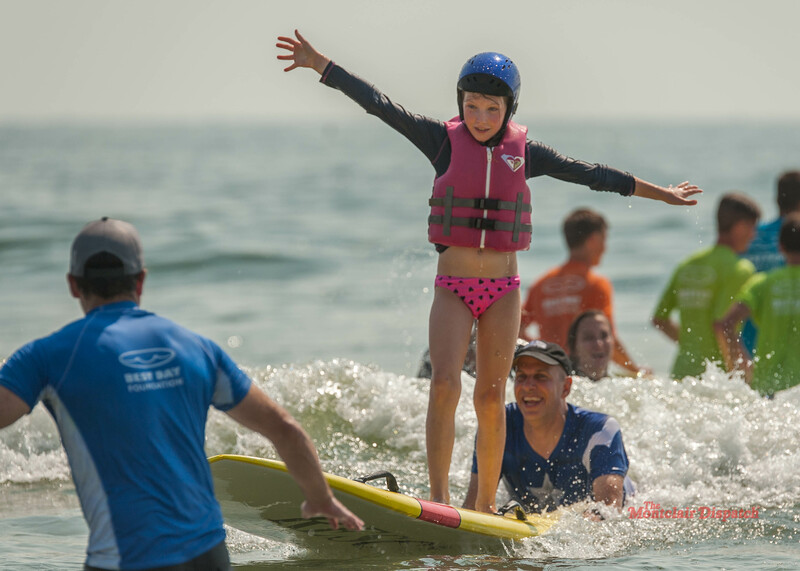 90 kids with special needs enjoyed a day of surfing, sun and tacos at Asbury Park, courtesy of the Best Day Foundation’s New Jersey Chapter. 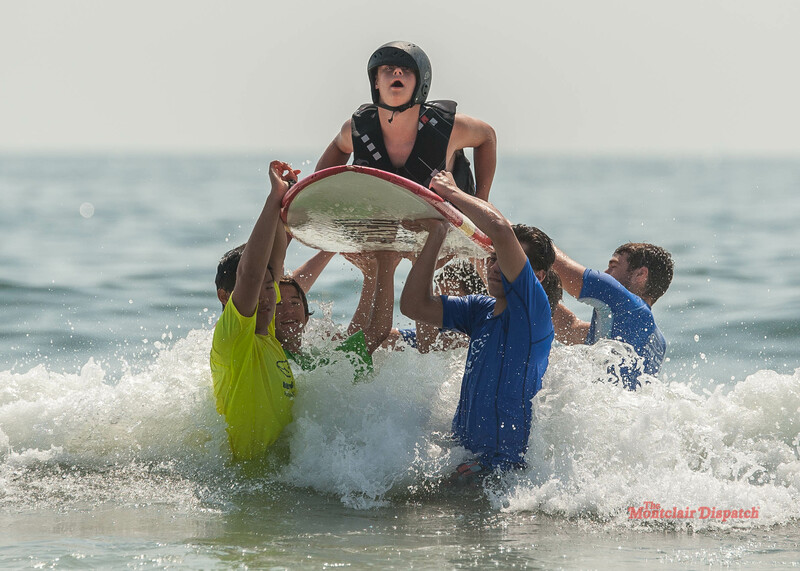 90 kids with special needs and their families joined 300 volunteers at the 8th Avenue Beach in Asbury Park, New Jersey on Saturday July 22nd and Sunday July 23rd for two days of surfing, sun and tacos. The New Jersey Chapter is the Best Day Foundation’s founding chapter, the current Co-Chairs are Alexis and Lake Downham. This weekend’s event was made possible by support from the volunteers, as well as local and national sponsors. During a typical summer season they will host 6 to 8 of the beach-surfing events. 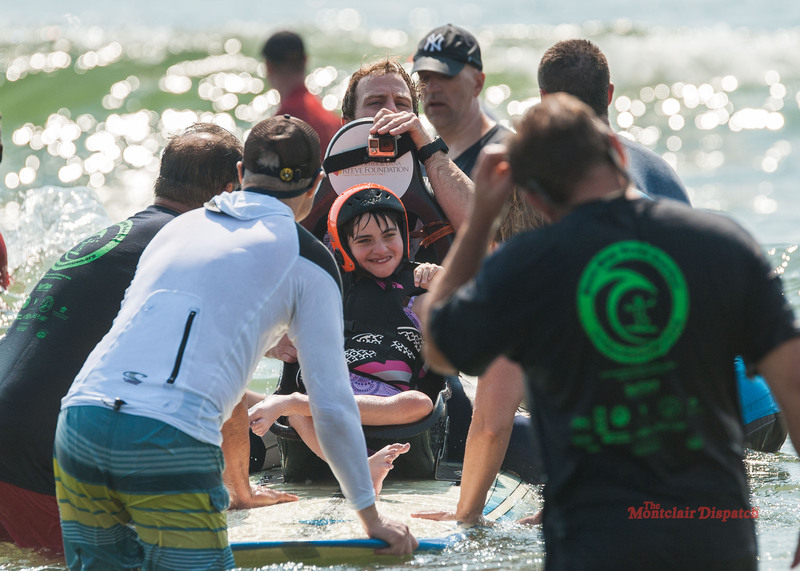 For many of these kids with special needs, this will be the first time they get to experience the thrill of surfing. To safely take these participants surfing requires at least a dozen experienced volunteers and a truckload of specialized equipment. Because of this, and the generosity of the Best Day Foundation, the experience of surfing is no longer out of reach for these participants. A participant happy after their turn surfing. Photo by Scott Kennedy for The Montclair Dispatch. A happy and daring participant surfing. Photo by Scott Kennedy for The Montclair Dispatch. the volunteers are all in position, a narrow funnel is created of caring, guiding hands that leads back to the beach, ready for the next big wave. Faster than the wind, they surf back to safety, water spraying as they go. Then come the screams, “Again! Again! Please Again!”, and the thrilled volunteers quickly assemble and it’s back into the water they go. On the second or subsequent rides, the participants will surprise everyone including the parents and other participants waiting on the beach. In the blink of an eye, the rider will jump to their feet, arms stretched wide as wings and a smile that can be seen 100 yards away. The ride only lasts a minute, but it’s the best minute ever for many of these kids. 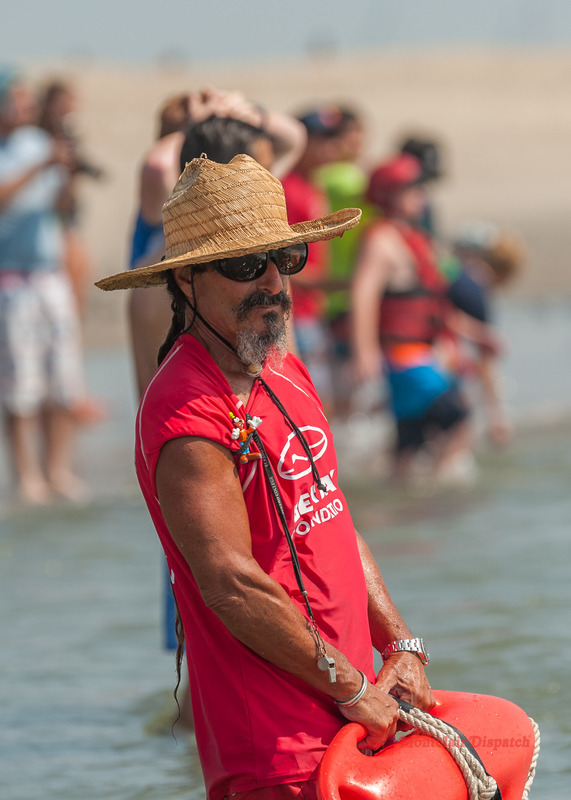 Scott Keller, Water Safety Director, watching over volunteers and participants to ensure safety. Photo by Scott Kennedy for The Montclair Dispatch. Water Safety Director, Scott Keller, a forty-year water safety veteran summed it up, “It will give you chills the first time and everytime you see the kids just so excited…something magical happens as soon as they hit the water.” Keller has been with Best Day for eight years now and says it never gets old. Keller starts his day making sure everyone understands that all participants must wear helmets and performance life jackets, no exceptions. Getting some of the kids with special needs into helmets is tough, but there is no option when it comes to event safety. Keller will interview and evaluate new volunteers and keeps an eye on the veterans. He will hover in the waist deep shallows somewhere between the teams, keeping an eye on everyone. He watches the water, tide, and subsurface currents. Amazingly, with six teams in the water, nearly one hundred people in all, with just three short bursts from his whistle every single person in the water turns his way for a directive, a benefit of the societal training from community pools and beaches everywhere. Keller uses his whistle sparingly, usually when one team drifts unknowingly into the path of another because of a subsurface cross current. Each team launches their surfer towards the shore through the waiting arms of the water crews who stand along the path to ensure all goes well. Each time, Keller is watching. After eight years he has developed a sixth sense on when a rider is going to bolt to a standing position or roll off into the water, he knows the look in their eyes and the shape of a coiled muscle just before they launch. Before they even get started, he is headed their way just in case. A participant as she reaches shore, into the arms of excited volunteers. Photo by Scott Kennedy for The Montclair Dispatch. Proudly, Keller says his Daughter Alina, who is 16 years old this summer, is on one of the water crews. On Saturday morning just after dawn, many of the veteran volunteers will gather out beyond where the waves break on their boards to catch up and get some surfing in before the volunteers arrive. There are about 100 volunteers who arrive three hours early to set up the event’s tents, lay out the rack of wetsuits, helmets, life jackets, long and short surfboards, and begin registering the volunteers and then the participants. Once all the volunteers are in, approximately 300 this weekend, and the area is staged for the participants, the volunteers are assigned into six teams. Lake Downham, Co-Chair and Coast Guard Rescue Swimmer will take charge and assemble the volunteers into teams or water crews. There is an established group of water crew team leaders. These are volunteers who have run through these beach events many times and they know the drill, the training, and the safety concerns. As always, the focus is on the safety and comfort of the participants. Many of whom have never ventured beyond the safety of the swash zone where the waves roll up onto the beach. Group shot of some volunteers by Scott Kennedy for The Montclair Dispatch. Typically, three to six water crews of 10-16 volunteers are formed. One large crew of nearly 18, made up solely of seasoned veterans, is assigned to cover the surfboard mounted with a bucket chair for participants who need a little extra support. All teams are equipped with 11 foot long, specially designed rescue surfboards. Each water crew is lead by a veteran and is assigned a set of ten to sixteen volunteers. 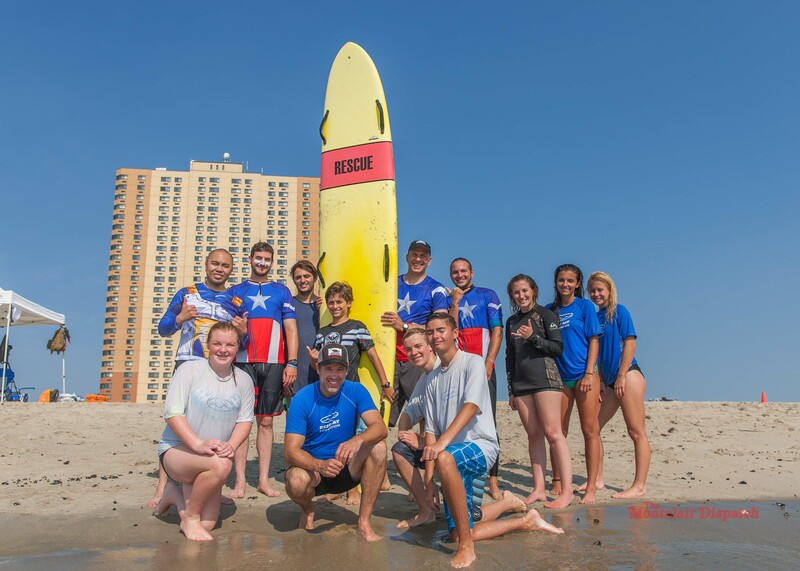 After a brief interview to determine the volunteers’ water skills, any special lifeguard training, and upper body strength assessments, the team members are assigned roles and practice runs out into the surf and back. Each water crew is broken down into three distinct groups. The participant’s surf-guide, usually the team leader, will ride along with the participant from start to finish. This person will ensure the surfboard remains trim and headed in the direction of the catch and recovery crews. They alone determine when and which wave to ride only after the all ready signal is seen from the entire team. The surf-guide is a veteran swimmer, strong enough to control both the surfboard and any unexpected movements by the participant. The deep water crew usually consists of eight strong swimmers, who along with the team leader, take the participant on the longboard from the beach out through the breakers to a point where they can catch the right size wave. The participant never leaves the safety of the longboard, surrounded on all sides by the deep water crew members. 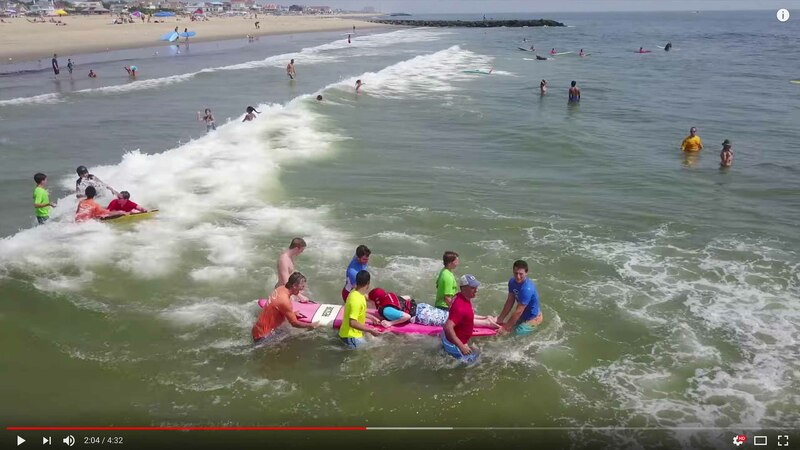 As a team, the deep water crew literally lifts the participant and longboard up and above each wave as it rolls and breaks underneath so as not to frighten the participant. Once the participant’s longboard and surf-guide are safely beyond the breakers, four members of this team will position themselves half-way back to the beach to guide the participant and longboard as they surf back to land, always watchful and ready to recover the participant if need be. The catch and recovery crew, whose responsibility it is to catch each participant and the surfboard as it comes ashore, deliver both to the safety of the dry beach berm and out of the water. The Zichelli Family. Photo by Scott Kennedy by The Montclair Dispatch. The event had a superhero theme, which was fitting because to all of these kids and their families, every single volunteer is a superhero. Not to disappoint, several of the volunteers wore Captain America jerseys. The Zichelli Family of Montclair. 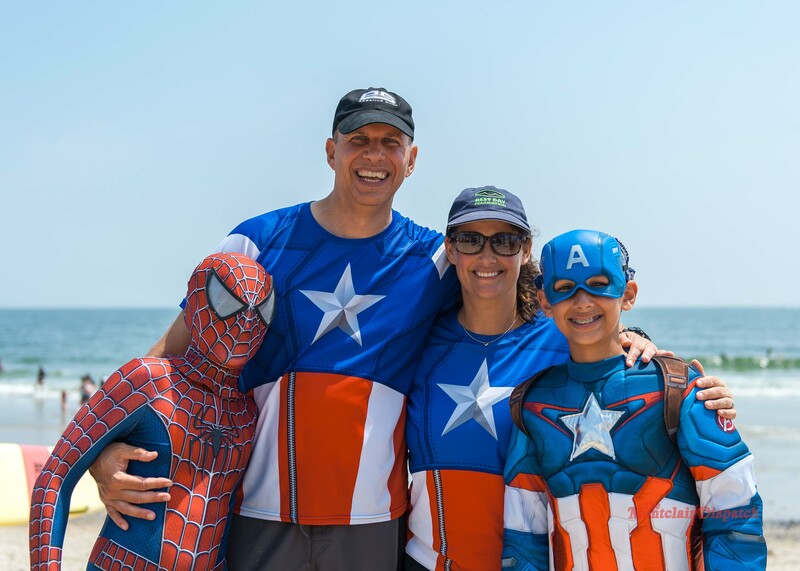 Lauren, Sam, Andrew and Mike, went all-in as a family dressed as Mom and Dad America with their two sons Sam, age 13, dressed as Captain America and Andrew, age 11, dressed as Spiderman. The Zichellis have been involved with Best Day since 2012, when their sons were just six and eight years old. Sam and Andrew opened the day’s event, welcoming all the participants as only Captain America and Spiderman, true superheroes, can. During the closing ceremony, every participant was honored in a medaling ceremony, complete with high-fives and cheers from the assembled volunteers and families on the beach. Presiding over the ceremony along with Capt. America and Spidey were the chapter’s Co-Chairs, Alexis and Lake Downham. A participant is lifted up by volunteers over a crashing wave. Photo by Scott Kennedy for The Montclair Dispatch. This event had a very special guest, Fred Trauerts, a professional photographer and drone pilot. Fred assembled this video of the event. Trauerts can be reached via his website www.njsurffitness.com. The Best Day Foundation, now out of Watsonville, California, is a very small nonprofit with a very big deliverable for the surprisingly small budget. Probably the best nonprofit in the USA for delivering true social benefits on the smallest budget we have seen in over 30 years. Operating on just annual donations of $142,000, they serve eight chapters spread out across the USA from coast to coast. Their annual debt is an amazingly low $154.00, that is correct, less than the cost of a surfboard. So no fancy boardroom, cell phones nor a fancy printing budget. The Best Day Foundation is all about volunteers, 116,000 so far, delivering awesome experiences to kids with special needs and their very appreciative families. If you would like to purchase any of these pictures, click on a photo in this article, or click here.